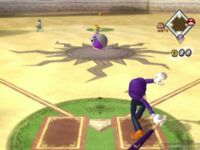 The Whiskered Eggplant is a power-up in Mario Superstar Baseball exclusive to Waluigi. In Challenge Mode, Waluigi had to purchase this eggplant item before he could use the Liar Ball, which is his Star Skill. However, Waluigi can only buy this if Wario is his team captain, or if he is on another captain's team. Also, this item is only available in Challenge Mode, as Waluigi is able to use the Liar Ball in Exhibition Mode without the need of an item. The Whiskered Eggplant is, as its name indicates, a purple eggplant with a moustache. Hige Nasubi Moustache Eggplant, from 「鬚」 or 「髭」 hige, meaning "beard/moustache/whiskers". This page was last edited on March 9, 2018, at 09:41.